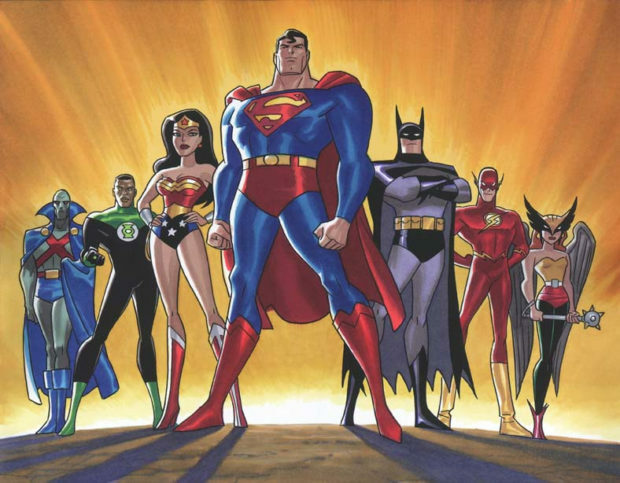 As we rejoin our heroes, the rest of the Justice League is in shock over John Stewart’s declaration of guilt. Superman and J’onn J’onzz decide to look in to the charges and order Flash to stall for time. Since John won’t defend himself against the charges, Flash agrees to be his lawyer in order to buy his teammates the time they need. The risk here being that whatever sentence is given to the accused is also given to the lawyer. There’s something you don’t see enough of, really. 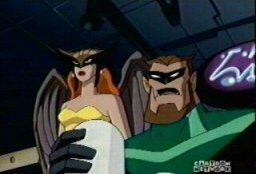 Hawkgirl, on the other hand, hits the local cantina to pick a fight with the other members of the Green Lantern Corps that have forsaken John (Killowog, Forian, Tomar-Re, Graz and one that looks like a giant red haired cucumber.) Killowog stops the brawl and convinces the other GLs to stand by John in his hour of need. 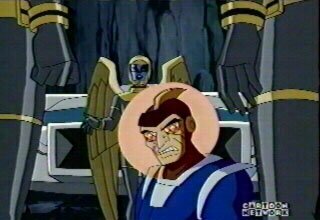 As Hawkgirl and the rest fly back to the courtroom, Hawkgirl catches a glimpse of Kanjar Ro talking to the Manhunters. They are clearly not exchanging recipes. Meanwhile J’onn and Superman land on the moon that once orbited the planet John is accused of destroying. Superman must have watched that episode of Bill Nye The Science Guy, as he realizes that if John really had destroyed the planet, its moon would have flown off in to space. Everything up to the last five minutes was pretty predictable if you’ve spent any time reading comics in your life, but nonetheless entertaining. John Stewart had the fewest lines for two episodes that were supposedly about him. We didn’t really learn about him as a character but rather a lot about the Green Lantern mythos in general. However, the ending did surprise me and left me looking forward to future episodes. So far Justice League fans should be pleased. It was better than any episode of Superfriends. Then again, if that’s how we rate the show, I can’t foresee anything other than five star episodes in the future. Next week: the return of everyone’s favorite sea chump, Aquaman!